Ace Ventura: Greenwall, hit the lights! The switch on the wall beside you! Go for it! [starts crawling around furiously as if to attempt a daring escape, then stops] ...Flick it, QUICK! Ace Ventura: All-righty then, shall we go to jail? Ace Ventura: I am yet to achieve omnipresent supergalactic oneness. Monk: No. Wait. There it is! You've just attained it. Monk: Yes, just now. You are one! I can see it in your eyes. You're more one than anyone! Ace Ventura: Mmm, this fruit paste is delicious, and the pottery is lovely. Fulton Greenwall: Guano is their chief resource, they use it to made many things in the village. Ace Ventura: Okay, everything here seems good. Big load off my mind. You can speculate all you want but unless you check it out for yourself, you never know. [chuckles] We should head back now. Fulton Greenwall: Aren't you going to go investigate? Ace Ventura: There's no reason for anyone to go in there. Ever. I... sense it as a holy man. Ace Ventura: IT'S DARK! I COULD FALL INTO A PRECIPICE! Ace Ventura: [gives look] Spank you, Helpy Helperton. Fulton Greenwall: Yes, but to the natives... Shikaka. Ace Ventura: Shikaka. [they kneel again] Shikakaaaa! [they kneel once more] Shikasha! [they begin to kneel but catch on that he didn't say the name right] Ahhh! Shhhish kabab. Shhhhhawshank Redemption. SHI-KAAAAGO! (Chicago) [Chief kneels] You're outta there! [points outside] Go on, you're gone, go on. Ace Ventura: [looks down] Yes, I have one right here. It's bulky, but I consider it carry-on. Attendant: [holding bag of peanuts] Peanuts. Ace Ventura: ...Oh, I see! Ace Ventura: Nice to meet you. Bumblebee tuna! Bumblebee tuna! Excuse me. [whispers] Your balls are showing! Bumblebee tuna! Fulton Greenwall: My name is Fulton Greenwall, and I am looking for an Ace Ventura. Fulton Greenwall: Oh yes. No names, how silly of me. Umm, he is an American. Fulton Greenwall: [thinking of any other descriptions] Yes, well, he bends over and speaks from his rear. Ashram Monk: Oh, him. This way. Fulton Greenwall: You must be very proud, Ace. 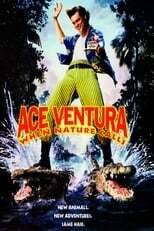 Ace Ventura: Pride is an abomination! One must forego the self to obtain total spiritual creaminess, and avoid the chewy chunks of degradation. Wachati Princess: That is a dart of the Watchootoo shaman! Quinn: Something wrong, Mr. Ventura? Ace Ventura: Of course not. This is a lovely room of death. Take care, now. Bye-bye, then. Ouda: Ace! He much better fighter than you. Ace Ventura: [looks annoyed] Doi! Ace Ventura: Ah, there's the consolate! Fulton Greenwall: Oh. Thank God. Ace Ventura: [still driving at top speed] Now if I can JUST find a parkin' spot! Fulton Greenwall: But don't you think we should slow down just a teensy-weensy bit?! Ace Ventura: Like a glove!